This is a sponsored post written by me on behalf of Chiquita Bananas. All opinions are 100% mine. I love bananas! The only banana brand that I remember eating since I was a kid was Chiquita! 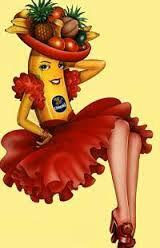 In 1944, the now famous jingle was released, along with Miss Chiquita, and it was a hit! Americans used the song to learn how to eat the–then–new and exotic tropical fruit. At it’s peak, this song was played 376 times a day on the radio all across the United States! An ad agency team led by Robert Foreman created the song. Foreman and his staff developed the jingle using office talent, an old piano and a box of paper clips shaken to simulate maracas. Garth Montgomery wrote the lyrics and co-worker Len MacKenzie provided the music. The singer in the original 1944 recording was Patti Clayton, the first in a long line of Miss Chiquitas. Join The Contest–You Could Win Big! Second Prize – a year’s worth of Chiquita bananas. Grand Prize – a year’s worth of Chiquita bananas for you and a friend. I even made my own video! I am defiantly not a singer so I went a better route for myself. It took a little while to create because my animals were not working with me, but at the end of the day I am happy with it! It was pretty simple to do through movie maker! So create your entry, submit it to the site and then post it online so your friends can vote for you! It’s that simple! And remember Milennials, have fun with it!